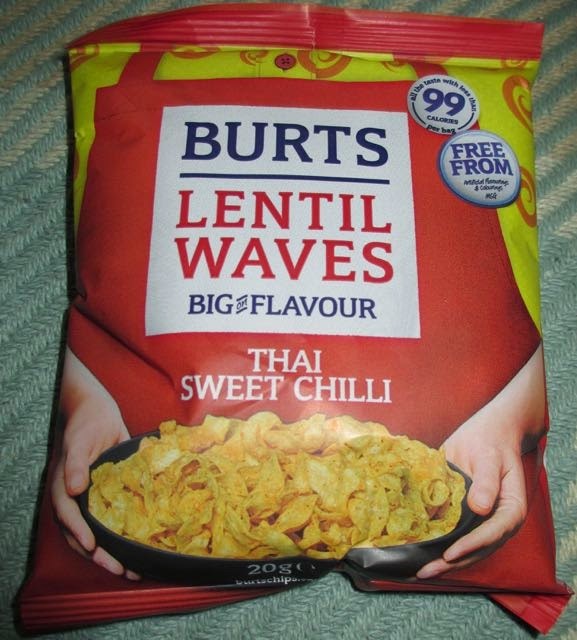 Burts of Roborough in Devon must know that I like to find alternative snacks to crisps in order to diversify my munching. They must know because it says "alternative snack" on the packet and they sent me this one try, right? Described as "combining the sweet and spicy fusion of chillies, warm ginger and fragrant lemongrass for an irresistible Asian tang", put Cinabar off immediately. Cinabar hates lemongrass. I certainly don't mind the stuff, although having said that, too much of it can taste a little (or a lot) like 80's washing up liquid. I say 80's because I was a kid then and believe me when I say that kids try to taste everything! 20g packet at 99 calories, fir every 100g there is 16.3g of fat, 1.5g of salt and 4.4g of sugar. Ingredients contain no artificial colours, MSG or flavourings; have 40% less fat with no hydrogenated fat, and are low on the glycemic index, including; Thai chilli flavour; sugar, rice flour, spices, natural flavouring, garlic powder, soy sauce powder, maltodextrin, herbs, salt, natural colour paprika extract; lentil waves contain; lentil flour, potato starch, pre-cooked potato starch, and salt. Suitable for vegetarians. Allergens; soy, and may contain wheat and gluten.